Love the look of this watch. The leather band is soft and comfortable. I have already received many compliments on this watch. It’s great for everyday and goes with a lot. Fossil's founding principal of bringing fashion and function together is visible in their unique styles. This women's watch from the Original Boyfriend collection features a blue leather strap and silver chronograph dial. Great watch, a little snug at first but it softens. The blue color is great! Everyday wear and Looks great dressed up or casual. Mix and match with bracelets. Beautiful watch. Pairs well with just about anything. Dress it up or down. Purchased for daughter's birthday. She loves it! 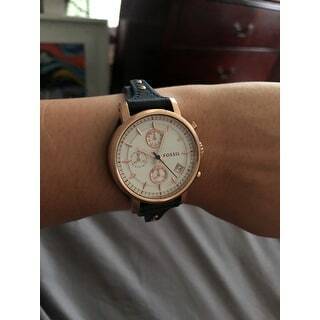 I am a great fan of Fossil watches, they are the only brand I buy. Great time keeping pieces with a wide range of looks. I was looking for summer watch to wear and am excited to wear this piece with my gold bracelets. Highly recommend to buy. "Hello! 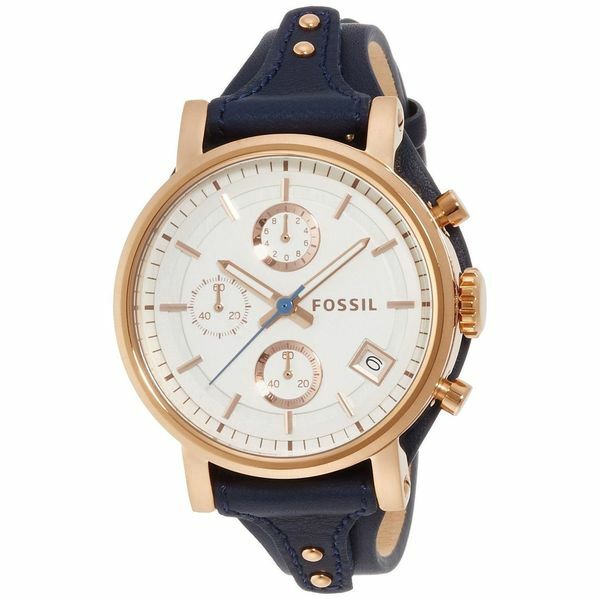 I would like to ask about Fossil Boyfriend's ES3838 Blue leather for woman. Is it with yellow or rose gold? Because in photo I van see yellow gold, but in description is written that it is with rose tone. And I need and I want with yellow gold of this model and colour."